Campesinos working the land or tending flocks in the river valleys and hills of the Sierra Norte would stop, fish for trout, or perhaps gather lobster-like langostinos after the first rains in May, and then cook their bounty in an unusual way. They would place their catch in a half-gourd filled with river water and freshly picked aromatic herbs, heat rocks from the banks to red-hot, then place them in the bowl and watch their meal quickly poach in a boiling broth. 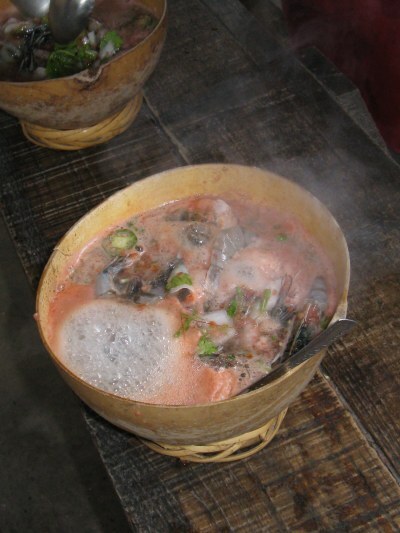 Caldo de Piedra, located a few minutes outside of Oaxaca on the highway leading to Santa María el Tule, ceremoniously replicates the age-old custom before your eyes. The restaurant is a large, simple palapa with an open kitchen. The menu is effectively non-existent since all that is served are generously filled quesadillas and similar appetizers, your choice of three soups (the caldos), and non-alcoholic beverages. The owners boast that this traditional meal preparation dates to pre-Hispanic times, and was practiced in their home village, San Felipe Usila, in the district of Tuxtepec. Service is uncharacteristically fast. Waitresses are eager to attend to orders, and more importantly answer all queries about your comida’s preparation, so be sure to ask to go over to the two kitchen areas to bear witness to the procedural pomp. On the one side are women working over metate (grinding stone) and comal (large round clay “stove-top” used for cooking over an open flame), hand-making tortillas for filling with your choice of quesillo (the famed Oaxacan string cheese), mushrooms, squash blossoms and more. On the other side unfolds the curious convention. A substantial helping of your choice of raw, medium sized shrimp, red snapper, or a combination of the two is placed in a jícara (the half gourd) with a selection of chiles, onion and leafy herbs including requisite cilantro. A blender off to the side is used to prepare a tomato-based liquid which is then poured into each vessel. With the aid of a large wooden tong, a couple of baseball sized river stones are plucked from a flaming fire pit, gingerly placed in each gourd, and voilá, your meal starts to boil. Rocks are added a second time, following which each comida-in-a-pot is brought to the table. Flavors remain distinctly discernable to the extreme, given that fresh ingredients are combined on the spot. The chef/proprietor is in complete control of process so as to assure the proper degree of doneness (with only one cooking method and a choice of only three main dishes, it’s pretty well guaranteed). It’s low-fat protein, herbs, vegetable and tortilla, yielding ideal fare for the diet and health conscious, in a region of the state noted for pretty well the opposite … and they even serve coca light (diet coke). It’s all so simple, making the experience gastronomically rewarding, while at the same time awe inspiring. Open daily, noon to 7 pm. Price with beverage and shared appetizers, 125 pesos pp. Alvin Starkman together with wife Arlene operates Casa Machaya Oaxaca Bed & Breakfast. Alvin received his masters in social anthropology in 1978, and his law degree in 1984. Thereafter he was a litigator in Toronto until taking early retirement. He and his family were frequent visitors to Oaxaca between 1991 and when they became permanent residents in 2004. 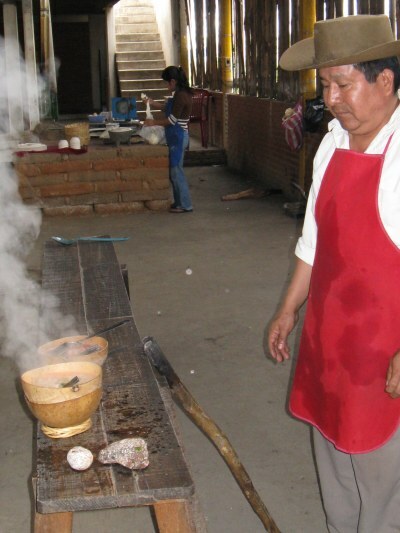 Alvin reviews restaurants, writes about life and cultural traditions in Oaxaca, tours couples and families to the craft villages, ruins, towns and their market days and other sights, and is a special consultant to documentary film production companies. This page has been visited times since September 9, 2008.